The Amish lead a simple life. Led by their strong beliefs in God, their work ethic and the way they actually live their lives is a testament to their faith. Leah is Amish. A middle child of eleven, she lost her mother at a young age to cancer. Her father, Samuel, didn’t rush into remarrying, so when, ten years later, he finds and rescues a young widow he’s never before met, things start to take a different turn. 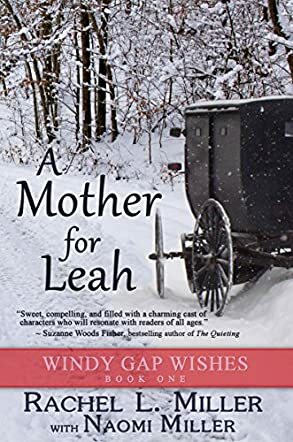 Rachel Miller’s Amish novel, A Mother for Leah: Windy Gap Wishes Book One, is a comfortable read. There is no conflict to spur this story forward; rather, it’s a simple story of faith and the never-ending cycle of life amongst the Amish, the cycle that leads the people through childhood, learning the faith, being baptized, marrying, having children and leading the next generation forward. The author uses words and phrases common amongst the Amish, both in English and in the old German/Dutch dialect used by the Amish (a glossary appears at the beginning to help the reader translate). Whilst the use of German/Dutch words here and there do add a touch of ambiance and sense of place to the story, it is somewhat overused at times. Overall, a pleasant read, a story written with compassion.